The creation of the single market is one of the EU's greatest achievements. People, goods, services and capital can move freely between EU Member States, just as they do within their own countries, unobstructed by borders and barriers. EU citizens can live, work, study and retire in any EU country. This freedom of movement is supported by the Schengen Agreement, under which 22 of the EU's Member States, along with a few non-EU countries, have agreed to abolish internal borders. EU citizens and many non-EU nationals can circulate freely within this area. The single market is also supported by the EU's currency, the euro, introduced in 2002 and now used by 19 of the EU's Member States (collectively known as the Eurozone). To use the euro Member States have to fulfil certain criteria such as price stability and sound management of public finances. The European Central Bank oversees monetary policy and helps to supervise Eurozone banks to ensure the safety and soundness of the European banking system. Euro coins have one side that is the same in all countries, but the other side shows a different design representing the country it was made in. The euro is the currency of the following EU Member States: Austria, Belgium, Cyprus, Estonia, Finland, France, Germany, Greece, Ireland, Italy, Latvia, Lithuania, Luxembourg, Malta, the Netherlands, Portugal, Slovakia Slovenia, and Spain. 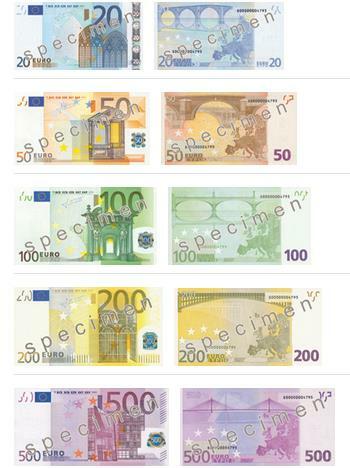 What do the euro banknotes look like? 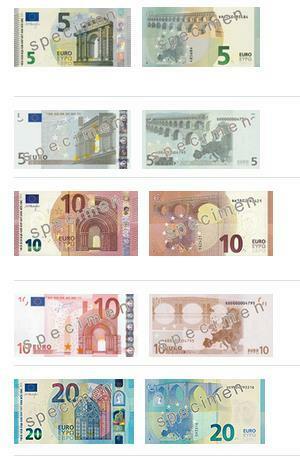 There are 7 denominations: 5, 10, 20, 50, 100, 200 and 500 euro. They are all exactly the same throughout the euro area. They illustrate the evolution of architectural styles in the history of Europe: windows and bridges bring people together. And what do the euro coins look like? One face is common to all the countries and represents cohesion between the Member States of the European Union. The other face shows national symbols chosen by the different countries. 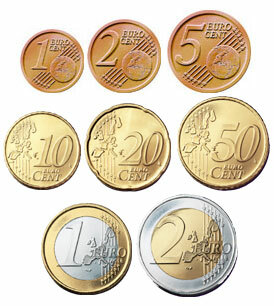 The common sides of the eight euro coins have different designs: €2 and €1, 50, 20 and 10 cent coins show either the European Union before its enlargement on 1 May 2004 or, as of 1 January 2007, a geographical image of Europe, while the 5, 2 and 1 cent coins show Europe in relation to Africa and Asia on a globe. All coins, whatever the national face, are accepted in all euro area countries. What are the advantages of the euro? One currency is all you need now. For instance, when you visit a museum in Italy, you can pay the entrance fee using euro coins left over from your stay in Greece; you can buy a meal in France with euro banknotes you got from a cash dispenser in Spain. This saves both time and money. There is no longer any risk of fluctuation between currencies. Interest and inflation rates are much lower. You buy, sell and borrow within a larger and more competitive market. Managing a business is easier and less expensive.